Ages 10 through 17. Make learning the parts of speech fun with the high-interest language building activities in this book. In addition to teaching students to identify nouns, verbs, prepositions, adverbs, and adjectives, the activities strengthen language skills that are critical for success in the classroom curriculum. Reproducible worksheets are included. 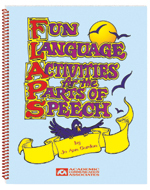 Each section of FLAPS focuses on a specific part of speech. Activities that target nouns, pronouns, prepositions, verbs, adjectives, and adverbs are included. In addition to providing students with "rules" for using specific grammatical structures, students practice using these structures in activities that build vocabulary, verbal reasoning, and expressive language skills. Thus children learn about the parts of speech and also practice using them. The lessons challenge students to think as they solve puzzles, classify words, correct silly stories, match words with pictures, organize words into sentences, and write original stories. The lessons help students reach classroom academic standards for grammar and various thinking skills that are critical for school success. Speech-language pathologists, special education teachers, and teachers in the general education curriculum can use the activities in this practical, easy-to-use book.